Wind on the mountains isn't so fine as on the beach, too gusty and variable, but flying in such places is too wonderful and amazing to resist, so I wish to share my fun. Great pics. Where is the Eclipse though? Spent a weekend at Aviano AB with a broke C5 and my road bike a few years ago. Road from the base to a ski resort at the top of the mountain. Stunning views! Thanks Jerry, yes the Dolomiti are stunning mountains. I guess you do refer to my last post (6 lines), so the Eclipses are flying in a field close to home and to the sea, where I live. Flying on the beach during summer is almost impossible, too much people and tourists: no room to fly. Only in some days when weather isn't fine and wind is low you can fly on the beach with short lines and a SUL only just because there is less people. Now that's what I call a flying field, that's very cool. Wow Wow Wow - Awesome photos!!! 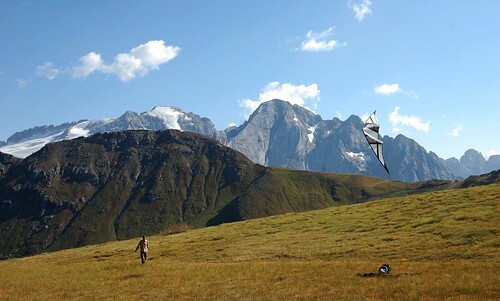 Very inspiring - a man, a kite, beautiful mountains. Seems like a place to spend some quality time and certainly my idea of a great vacation. Truly an inspirational setting for kite flying. I wanted to play "The hills are alive, with the sound of music." while I looked at the pictures. Great photos Paolo, where were you exactly? Ciao Walter, the location was the Pralongià, Val Badia, do you know it? i also had a chance to fly in the dolomiti. the wind was crap but that was pure joy and fun.